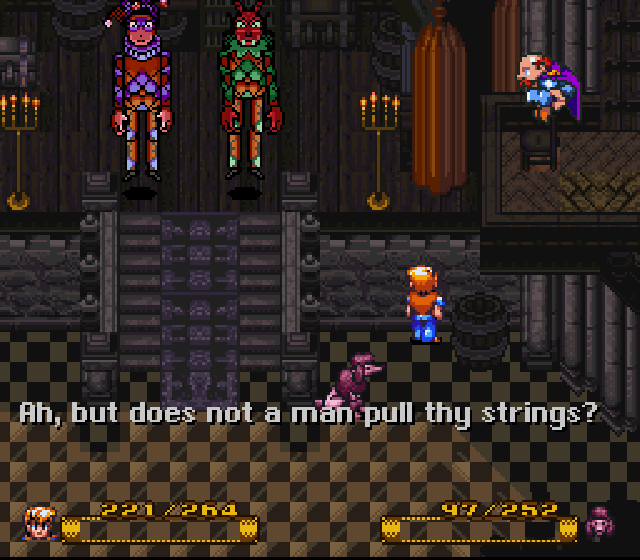 It’s fair to say that a game like Secret of Evermore would meet with less hostility these days. The thought of a Western console RPG is no longer an affront to gamers raised on Japanese genre products. Back in 1995 though, what many Square fans in the Western hemisphere wanted was a localised Secret of Mana 2 / Seiken Densetsu 3. What they didn’t look for was a down-to-earth alternative to JRPGs’ heroic melodramatics. Especially if it was littered with fictional pop culture references and had a metaphysical, light-hearted tongue-in-cheek approach. And so, Secret of Evermore began its uphill battle. Sadly, its music got caught up in the struggle – entirely undeservedly so. 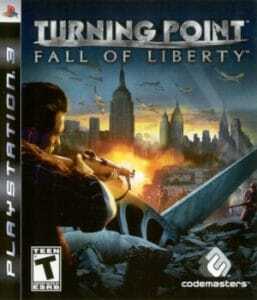 Even decades after its release, perceptions of future star composer Jeremy Soule‘s debut seem highly ambivalent. Grievances raised against the Secret of Evermore soundtrack usually include that there is hardly any music in the first place (the game uses ambient sounds more extensively than any previous console RPG, but there is still close to an hour of melodic material to enjoy); that the score album leaves out too much music from the game and focuses too strongly on one of Evermore‘s time periods (on the contrary, the album does a great job at gathering the majority of worthwhile compositions from the game, which simply happen to mostly feature in the world of Gothica); and that the music itself is unremarkable. That last point seems to be often made by game music fans expecting Secret of Evermore to sound like a JRPG. But not surprisingly, its music is as much a departure from genre conventions as the game’s overall stylistic direction. 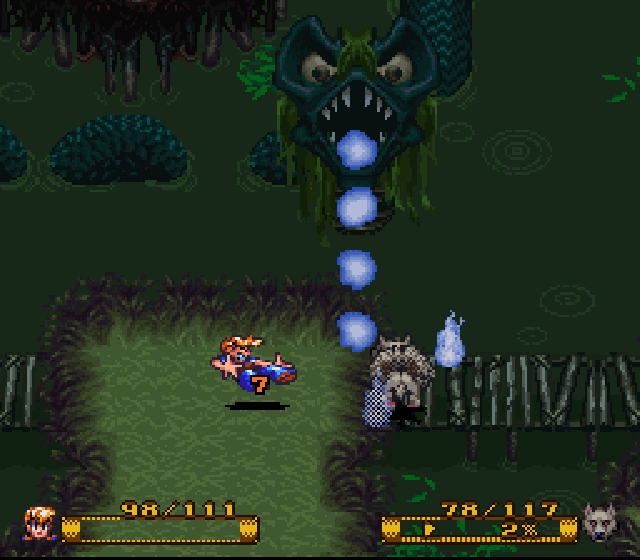 What’s often overlooked is that the Secret of Evermore soundtrack bears one crucial similarity to Secret of Mana. Both works take an individualistic, innovative approach to scoring an RPG. They look for alternatives to the usual, late-romantic orchestral sound that the RPG genre seems to attract. Ironically, Soule’s demo tape, which landed him his first composing gig, seemed to follow down precisely this well-trodden musical path. According to Evermore‘s producer Alan Weiss, Soule’s original compositions were a mix of John Barry and John Williams. 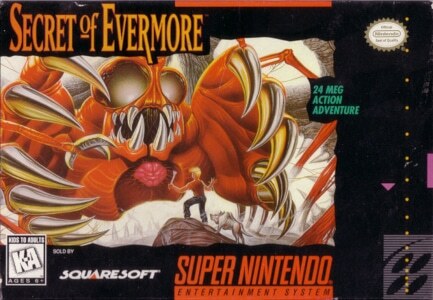 Maybe it was due to the SNES’ limitations that Soule’s music for Secret of Evermore turned out so astonishingly different from his film music inspirations. According to Weiss, the young composer was used to working with far more advanced digital sound technology. But in fact, the SNES sound chip’s constraints may have been a blessing in disguise. After all, it’s hard to ignore that Secret of Evermore is still by far Soule’s most creative work. Somehow, Soule manages to find a fitting musical equivalent for the game’s peculiar low-key mood and pursuit of realism (that still accommodated Gothic castles and rampaging robot butlers, mind you). As you would expect, there’s little of the RPG genre’s usual high fantasy heroism to be found here. No confessional melodramatics in sight – even the soundtrack’s ‘flying’ cue, usually THE opportunity for an RPG composer to cut loose and write a soaring piece of music, is a fairly subdued, but nonetheless fascinating affair. Throughout the score, Soule prefers to write for small orchestral ensembles, usually led by intimate woodwind and acoustic guitar soli. They alternate between ‘mysterious’ and ‘quietly spellbinding’ through their chromatic melody lines, which cleverly incorporate folk and jazz influences. There’s a subtlety to Soule’s approach that belies his relative inexperience as a game music composer in stunning fashion. These are compositions with an astonishing amount of emotional ambivalence and complexity. They also show a composer in full command of the expressive capabilities of the instruments he deploys. The overall, dominant mood on Secret of Evermore might be one of melancholy and autumnal lyricism. But sombre menace, quirkiness and ethereal allure hide just beneath the surface, and it takes a bit of patience to unearth the music’s melodic beauty. Yes, contrary to its reputation, the Secret of Evermore soundtrack features a wealth of wonderful melodies. They might be less hummable than their JRPG counterparts. However, they’re just as rich and maybe even more enticing, heading into unexpected harmonic and rhythmic directions. A final crucial piece of the puzzle is the striking quality of the samples Soule uses. This is of particular importance on a soundtrack that uses so few musical elements – and each one needs to make its full impact. It’s impossible not to marvel at the life-like nature of Secret of Evermore‘s acoustic guitar lines. Even better, the various woodwind instruments heard throughout the soundtrack have a welcoming, warm glow that never fails to beguile. It might sound a bit like heresy, but detach yourself from the many preconceptions that history has burdened Secret of Evermore‘s music with, and it emerges as one of the best RPG scores written for the SNES. Restrained and sophisticated, the Secret of Evermore soundtrack hits the perfect balance between atmosphere and melodies.